Here is how I set it up... One of my shoes break during the day. (OK the strap really comes undone.) Then I "call" my dear husband and ask him to bring me a new pair of shoes. About 15 minutes later someone from the front office delivers a large bag of shoes to me. (I brought a bag of assorted shoes in and set up the delivery.) Then I sit down with the class to go through the bag of shoes my husband brought me. He is really BAD at picking out shoes! As I pull out the shoes one pair at a time, we discuss why they aren's a good fit for me. I have a pair of tiny kid shoes, way to small for me but just right for the child they belong to. A pair of my husbands shoes that are way to big for me but just right for him. I also have a pair of my daughters dance shoes, they fit but are a little tight. Still, they are not right for me, I don't know how to tap dance! There is also a pair of really sparkly, light up Sketchers that all of the cool kids are wearing! However,even though I like them, these shoes are too small for me. Finally, a pair of my shoes and they fit! Only problem is they are high-heeled dress shoes with rhinestones. They don't really work for the purpose of school. Ahhh.... my faithful flip-flops! I LOVE these well worn flip-flops but, they aren't right for school. They offer no support for me. Then at the bottom of the bag I finally find my "just right" shoes! They fit me, support my foot and match! The kids love this lesson and think my hubby is completely crazy! Then I proceed to talk about how finding the the right book is just like finding the right shoes. I also go over the "I PICK" strategy for picking books. Here is a great follow up activity I then do with the kids. 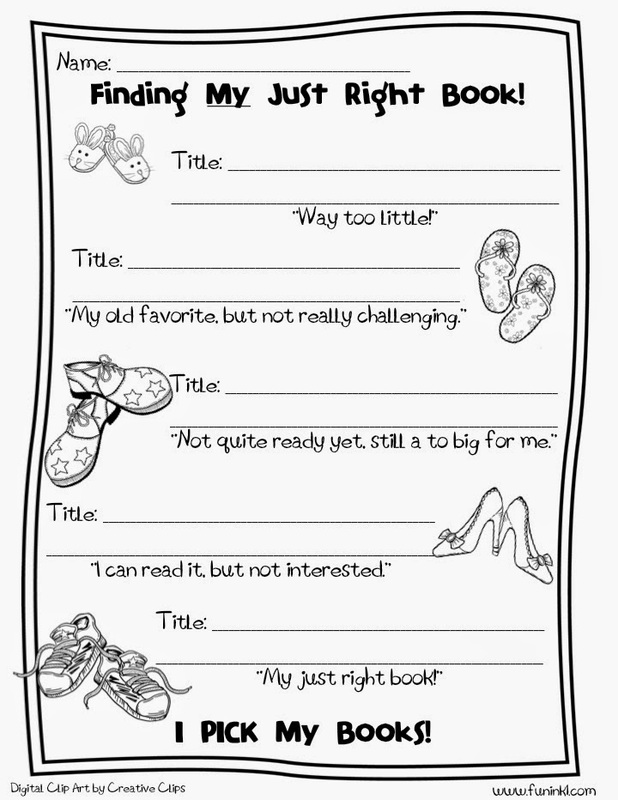 They have to take this sheet and look in my library to find their own "just right" and "not a good fit" books. I thought I would share it with you! Click here to download it. What a fantastic lesson for the concept of a just right book! Thank you so much for sharing! What a clever idea, Teresa! Thanks for sharing!